This might seem a controversial statement. But before you Lefties scream “Warmongerrrr!” and make a move for my entrails, allow me to qualify that statement. 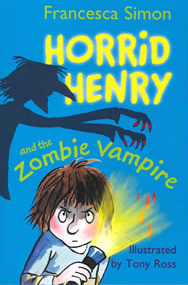 A colleague of mine was trawling the internet last week when he stumbled upon a recently-published children’s novel entitled Horrid Henry and the Zombie Vampire. He was struck by the title, fearing that this novel might be an unauthorised re-working of my own story, Vambie Zompire: The End of Days, and so immediately alerted me. Had I fallen victim to plagiarism (again)? Based solely on the title of the novel I understood why my friend had raised the plagiarism alarm. However, even though I had not read it, I must say I did not share his concerns that my Vambie Zompire idea had been ripped off for the story. As I pointed out to him, even if the author was pushing the boundaries of what is acceptable, it was very unlikely that a publisher would release a children’s novel centred around a night-long supernatural slaughter-fest, featuring rectal-impalement, brain-eating, and one instance of suffocation by dismembered testicles.